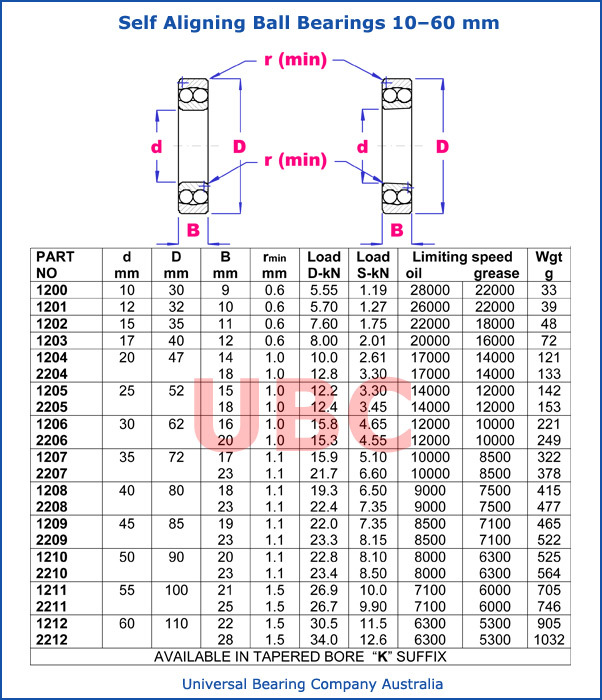 Self aligning ball bearings 10 - 60 mm 1200-2200 series UBC Universal Bearing Company With double ball rows and a spherical raceway in the outer ring self-aligning ball bearings can compensate for installation errors or shaft misalignment. The SNR double-row self-aligning ball bearings are useful for applications requiring high rotating speeds while exercising moderate radial and moderate or low axial loading. SNR proposes an extensive range of self-aligning ball bearings available with or without seals. Certain Series are fitted with an increased width inner ring (11200 11300 Series) for easier fitting on shaft.